October 15 is Blog Action Day with a topic that’s certain to motivate a cornucopia of collaboration: The Power of We. Some history. Founded in 2007, Blog Action Day brings together bloggers from different countries, interests and languages to blog about one important global topic on the same day. Past topics have included water, climate change, poverty and food with thousands of blogs, big and small, taking part. It’s a big day on the social web. 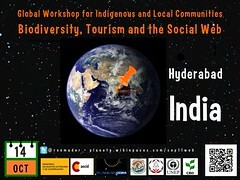 What I’ll post on October 15 is a summary of the workshop one day earlier in which we focus on Indigenous and Local Communities: Biodiversity, Tourism and the Social Web.